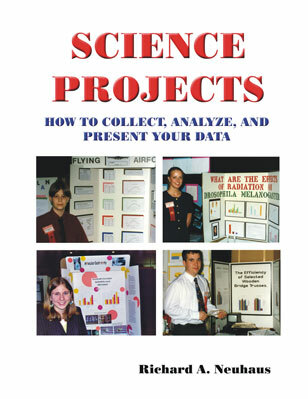 Science Projects: How to Collect, Analyze, and Present Your Data details the statistics of managing a science project. It emphasizes the scientific method of analysis, and encourages the use of computer software to do the statistics. The other books in the series, numbered 1 to 4, offer open-ended project ideas in the disciplines of life sciences, chemistry and biochemistry, physics and engineering, and earth and space sciences, respectively. The author lists references to techniques for each project suggested. The "references to techniques" are from U.S. journals, magazines, and books. An intuitive approach to the statistics for the high school student. Emphasizes scientific method of analysis, graphing techniques, and use of computers for statistical analysis. 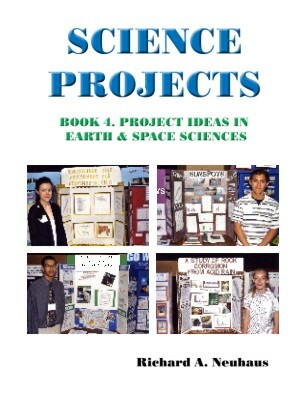 Examples in this 184-page book suggest many science projects. Included is a unique flowchart to aid the student in selecting the appropriate statistical test. Also included are numerous illustrations and a variety of photographs of winning science fair projects. A comprehensive Index rounds out this well-written book. What Do You Hope to "Prove"? • What You Should Know about Collecting Data • When to Use Significant Figures • How to Organize Your Data in Tables • Do You Need Life Tables? • How to Make Better Line Graphs • Do You Need a Standard Curve? • When and How to Make Bar Graphs • How to Select a Proper Statistical Test • Ways to Analyze Your Data • Calculators and Computers That Do the Statistical Work for You • What Are the Odds That You are Right? Glossary of Terms Frequently Used in Software Programs of Statistics • Bibliography • Recommended Reading ("Oldies but Goodies") • Where to Find the Software for Statistics and Graphs • Symbols Used in the Text. An excellent resource for project ideas in the life sciences. This book describes over 100 open-ended projects on bacteria, plants, animals, and environmental issues. Notes and references to techniques are included. 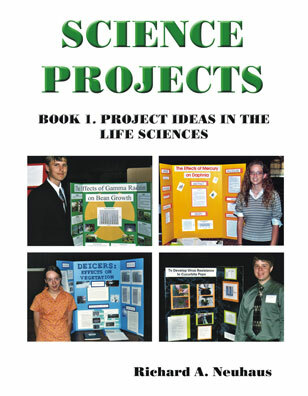 Guides to report writing and science fair preparation complete this 184-page book which has multiple illustrations and photographs throughout. This book is geared primarily to students in grades 9-12. However, seventh and eighth graders may also find it helpful. Open-Ended Projects in Bacteria – Some examples: The Use of Bacteria to Control Weeds • The Effect of Temperature on the Nitrogen Cycle • The Effect of Mouthwashes on Bacteria • Disinfecting Plant Material in Preparation for Tissue Culture • Testing Milk for Bacteria • Testing Water for Bacteria • Testing for Normal Bacteria on the Surfaces of Plants. Open-Ended Projects in Plants – Categories: Seeds • Plant Growth • Soil and Hydroponics • Plant Longevity • Plant Cells • Genetics • Potpourri. Open-Ended Projects in Animals – Animal Groups: Rotifers, Water Bears, and Water Fleas • Clams and Crabs • Bugs • Tadpoles and Frogs • The Domesticated Rat • Human Volunteers. Open-Ended Projects in Environmental Science – Field of Study: Air Pollution • Water Pollution • Waste Management and Recycling • Population Explosion • Projects Neither Here Nor There. Rules for Research Involving Live Vertebrate Animals • How to Write the Science Project Report • How to Prepare for a Science Fair. Valuable resource for project ideas in chemistry and biochemistry. Describes more than 100 open-ended science projects in these fields of study. Projects are grouped according to level of difficulty. Includes notes and references to techniques. Safety procedures are emphasized throughout the text. No dangerous chemicals are suggested. Provides guides to laboratory safety, preparing chemical solutions, writing reports, and preparing for science fairs. This book is geared toward grades 9-12; but that does not imply that capable students in grades 7 and 8 cannot benefit too. 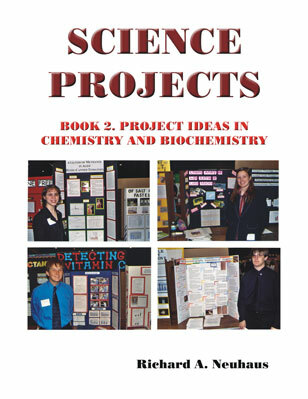 Chapters 1 and 5 are Level 1 project ideas designed for students with no knowledge of chemistry. Chapters 2 and 6 are Level 2 ideas. These project ideas are for students who are familiar with chemical elements, compounds, and mixtures, as well as some chemical terms such as atom, molecules, and reactions. Chapters 3 and 7 are intended for students enrolled in a chemistry class or who know how to write chemical equations and understand the mole concept. Chapters 4 and 8 are for students with an equivalent knowledge of a high school chemistry course. Laboratory Safety — What You Should Know to Protect Yourself • How to Prepare Chemical Solutions • How to Write the Science Project Report • How to Prepare for a Science Fair. 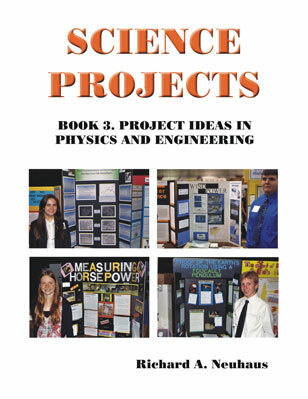 Describes more than 100 open-ended science projects in physics and engineering. Each project is suitable for any grade level from 7-12, depending on the depth of analysis. The math skills needed, for the most part, vary from simple arithmetic to Algebra I. Each project suggested includes notes and references to techniques. The book includes guides to Laboratory Safety, Mathematical Analysis, Writing Reports, and Preparing for Science Fairs. Opposites Attract! • Mechanical Things • Things That Spin • Fluids at Rest or in Motion • Electrical Things • Hot Stuff • "The Sound and the Fury" • "Let There Be Light!" • Invisible Light. General Engineering and Technology • Agricultural Engineering • Technology Applied to Ideas in Book 1: Life Sciences • Technology Applied to Ideas in Book 2: Chemistry and Biochemistry. "Safety Last" – What You Should Know to Protect Yourself • How to Measure Rotational Motion and Energy • How to Write the Science Project Report • How to Prepare for a Science Fair • Conversion Factors. Focuses on numerous open-ended science projects in earth and space sciences. Each project is suitable for any grade level from 7-12, depending on the depth of analysis. Includes guidance for using the online GLOBE and NASA programs. Notes and References to Techniques accompany each project idea. Provides guides to Laboratory Safety, Measuring and Controlling Relative Humidity, Writing Reports, and Preparing for Science Fairs. Weather and Climate • The GLOBE® Program • Geology • Astronomy • NASA Programs. "Safety Last" – What You Should Know to Protect Yourself • How to Measure and Control Relative Humidity • How to Write the Science Project Report • How to Prepare for a Science Fair.